After a few more wrong turns, I found the right one and was greeted by my friend at the community hall door which slid open to one side. Steam from the already boiling water and work came rising out into the open air quickly and was cut off as I was ushered in to a warm hall covered in tatami and busy people already working on set tasks. While I was taking my shoes off and putting on the slightly too small guest slippers, I was given a bandanna and apron to get straight to noodle making. The noodles we made were 100% soba flour and water, as far as I know you can also use a combination of buckwheat and wheat flours and I don’t know about the taste difference but I think these ones were delicious and it’s easier just to use one type of flour and water. The flour and water was weighed out and once it has been mixed by hand to a dough it should feel ‘together’ but not wet ( I can’t remember the proportions unfortunately but it I’m sure they can be found online). What I really like about cooking (and baking) is that there are so many cultural crossovers of flavours and techniques. When I was shown how to mix the soba flour with the water, the flour turned into small pieces of ‘dough’. These small pieces were then rubbed together quickly, it was as if I was making a crumble topping for a rhubarb crumble with flour and butter. It was really comforting..that might sound weird but after living in Japan for five months, still a beginner in the Japanese language and slowly getting used to life here it’s really good to feel little a comfort from home in some small ways. Once the dough was ready I was shown how to roll out and form the soba, ready to be cut into strips for noodles. We used soba flour to sprinkle over the dough and cover the rolling pin to prevent sticking, rolling out the soba dough into a circle to begin with, then the soba sensei (teacher) showed me how to wrap the dough around the rolling pin gently, and roll one side of the dough on the table to form a ‘corner’. We wanted four corners to form a soft edged square. The dough was ready once it had reached this soft square shape and was about 2-3cm thick. I folded the dough so that when I cut it with my giant noodle knife it would form long noodle-y tasty looking strips. Of course the sensei set up the wooden block and knife for me (the block is used as a guide for cutting) and I then had to embarrassingly tell him I was left-handed so he proceeded to change it all around..oops. They are cut into strips about 15cms long and 1-2cms wide. The noodle strips were gathered and boiled in a huge pot of boiling water stationed outside along with giant sieve-looking noodle scoops (I’m sure they have a proper name!) for only one minute. The noodles are so soft and made with simple ingredients and that’s all they need. In this soba noodle dish the broth is clear (pork based ) and the soba noodles are quickly reheated in the boiling water for 10 seconds before being poured into the broth once all the other ingredients are ready. In this dish there is: finely chopped spring onions, the pink and white shape is ‘Kamaboko’ a cured surimi which is a processed fish product, used in a lot of Japanese dishes, hot or cold. The sausage is possibly fish…it was definitely processed but picked up all the flavours of the broth and vegetables. On the top the light coloured pieces are fried dough (I’m not sure what kind of dough..) and grated mikan (satsuma) and that orange flavour made this whole dish sooooo delicious! Honestly this was so fresh, the noodles were incredible and I felt a great sense of community taking part in making this dish for everyone to enjoy. I still can’t really join in with conversation right now with my non-existent level of Japanese, I still have a lot of studying and practicing to do, so I think creating something really helps me to connect with people. I can watch and learn, help out and join in even if I can’t join in with daily gossip. My other outlets have been the calligraphy club at High School and very recently a pottery class (and the pottery sensei makes INCREDIBLE food which I will definitely be writing a post about). 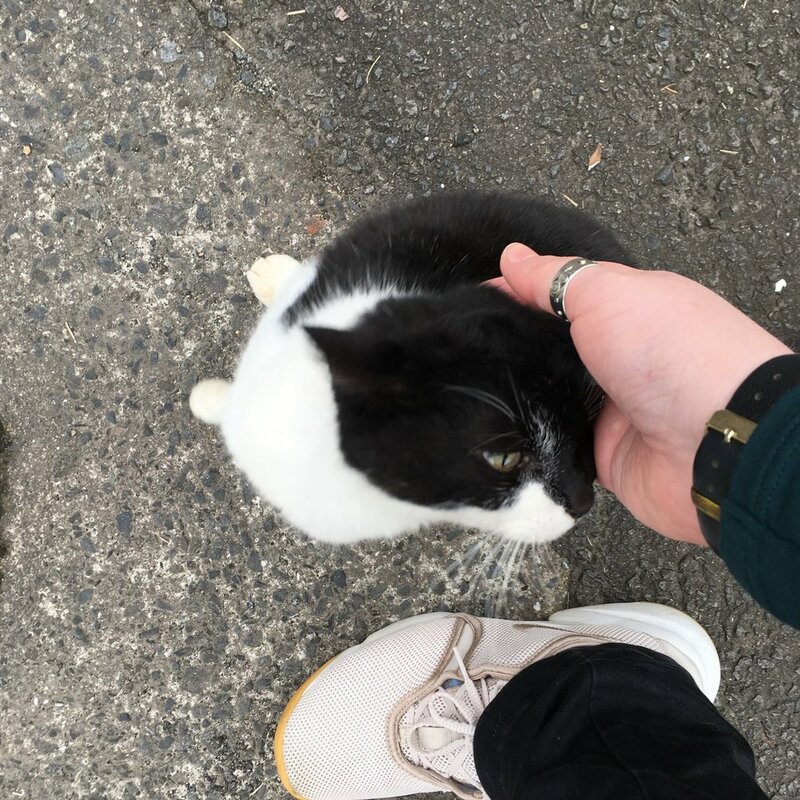 On the way back home I bumped into my old pal Mochi, a friendly boy who lives in many different houses and lives his best life, so it was a perfect end to my noodle making day! Newer PostC'mon and SLAM and welcome to Japan!